In addition, please read "tracking your book sales" and "making a bestseller" and choosing and Justifying your Computer book proposal. The Amazon sales rank is a number that says how many other titles sold more than your titles. The smaller the Amazon Sales Rank number, the better the sales. The Amazon sales rank is normally re-computed daily. You will also see fluctuations in the Amazon sales rank when your book is first released on Amazon. As the initial backorder are filled, the sales rank plummets (sometimes below 1,000) for a brief period. You might also see dramatic drops in Amazon sales rank when a large Corporation or a University buys your book as a textbook. Amazon's sales rank is calculated as a rolling figure. It's based on sales over a recent period. I can't remember if the period is 60 or 90 days, though. It is, however, weighted by overall total sales (they put this back in after having dropped it for a couple of years), keeping long-term big sellers afloat even after their sharp sales peaks have leveled out. Not all books are recalculated with the same frequency. The top 1,000 are recalculated hourly. The next block (up to 100,000, I think) are recalculated weekly, while the rest get checked monthly. However, a sudden burst in sales is enough to force an immediate recalculation on a 100,000+ book. This is probably based on a percentage of overall sales, but that's just a guess. 1 - 10,000 are recalculated every hour. 10,001 - 110,000 are recalculated every day. Above 110,001 are recalculated once a month. To begin with, any book which has no assigned sales rank has yet to sell even one copy on Amazon. So, if you're looking at a book with a sales rank of 4,000,000, then you at least know it has sold at least one copy. Rosenthal also says that all items are assigned unique rankings. So if you're listed at an Amazon Sales Rank of 34,385 (my book's Amazon sales ranking for May 10, 2001), then there are only 34,384 books selling better than yours, and your book is selling better than approximately 4,000,000 other books. Rosenthal estimates that Amazon sells over 150,000 books per day. 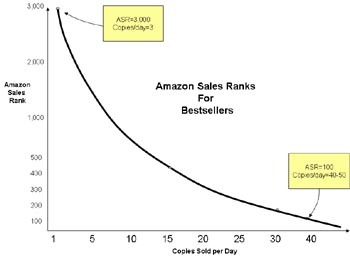 Using that as a baseline, he has developed a chart where he plots Amazon sales rank against sales. The top-selling book MAY be selling as many as 3,000 copies a day. The 10th best selling book MAY be selling up to 650 copies a day. The 100th book MAY be selling up to 100 copies a day. An ASR above 10,000, it gives books / day / 5 (approx. the number of years Amazon has been tracking ranks). In other words, if you sell 14 books, you'll get a rank around 900,000. The graph will tell you that you're selling around .006 books per day, multiply by 365 and get = 2.1 books / year. 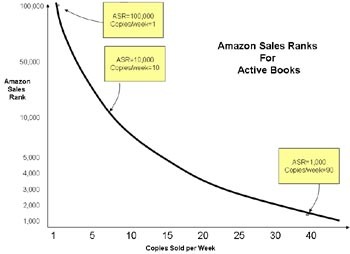 Since Amazon has been doing this around 5 years, the graph predicts you've sold around 11 books - pretty good! It doesn't matter if you sold 11 books seven years ago, 11 books last week, or just over 2 books a year for 5 years, the rank will be the same.